I’ve already told you that I believe in other people’s dreams. I want this blog to be the kind of place where those dreams can be shared. So today I’m making room for Misty Gatlin to share about a literal dream that turned into something so much bigger than she ever imagined. That’s what dreams do. I’m a wife, mom, high school teacher and youth leader. I’m from a tiny little town in Northeast Texas where I graduated from the only high school in the district and in a class of 78 students. I now teach in a school district which has 4 high school campuses and graduates several thousand each year. I love hanging out with my kids, and I’m truly blessed with the life God has given me. Can you give us a synopsis of the book? Sarah defines herself as many things; broken, damaged, addicted, and hopeless. Hurt at an early age by someone dear to her, she retaliates by living a life filled with destruction. Her past has finally caught up with her, and she’s ready to call it quits. Her story unfolds when she meets a compassionate stranger who helps her realize past decisions don’t define who she is, and what she thought was the end of her story is only the beginning. A life-changing decision is placed in front of her, and she’s forced to face it head on. What will she choose, and where will that path lead her? Can you tell us where you got the idea for A Princess Broken? This book came to me in a dream one Sunday afternoon. I woke up and knew I was supposed to write a blog series, and I knew 3 things about it: The title, the reason for the title, and that the main character would have crown necklace she always carried with her. I knew nothing else about it, but I started writing anyway, and it just continued to grow. 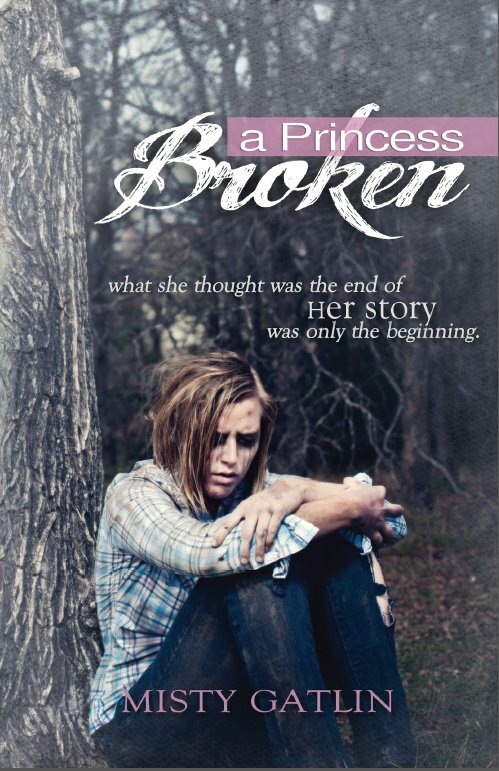 I kept wanting to change the title to A Broken Princess, but I knew it wasn’t right. The entire storyline is based off this title. This is a story of brokenness AND redemption. The princess in her was never gone simply because she made mistakes and saw herself as broken. She just had to be shown that she was still a princess in God’s eyes. I find it ironic that I’m a writer of fiction who published a non-fiction book and you’re a non-fiction writer who felt called to tell this story. In what ways did God stretch and grow you as you delved into this new aspect of writing? God made these characters come alive in my head. He showed me that I could write something so real that the characters could easily come alive in the minds of the readers as well. I had to learn how to write everything I saw, felt, smelled, and experienced with the characters living in my mind. That was completely new to me and took me a while to get used to. I believe this book helped me become a better writer. Knowing how much God shaped my writing through the process of Beyond Waiting, I have no doubts that Misty is a better writer now that she’s completed this work of fiction. I’m so excited for the places God is taking this dream and can’t wait to hear of how A Princess Broken has impacted the lives of its readers. Thanks for sharing your dream, Misty! Sign up so you'll get new posts delivered straight to your inbox. These little people are my favorite. Oh look. My two favorite things have been combined on one tiny wrist strap. Had the best night with these ladies. Thanks for being my lifelong slumber party pals! Dating Isn't the Issue; Waiting Is.